Industries worldwide have discovered the advantages of robotic integration, installing a diverse range of robots. RTA will help you to eliminate common welding problems and discontinuities such as: undercutting, excessive melt-through, incomplete fusion, incomplete joint penetration, porosity, weld metal cracks and heat affected zone cracks. All these arc welding systems comprise a robot, welding torch, gun cable assembly, wire feeder, and power and gas sources. Usually the welding torch is attached to the robot wrist with an intervening collision sensor or break-away coupling. Internal robot software allows for control over welding arc voltage and wire feed speed. Other signals are transferred from the robot to the power source to turn on the arc shielding system, start the welding process and control manual wire feed forwards and in reverse. Signals are sent from the power source to the robot after the arc is established so that the robot can move along the weld path. All of the above systems require repeatable placement of the weld joint relative to the filler wire. For quality welding, actual maximum deviation tolerable depends on the process, part thickness, welding position and joint geometry. Where the total deviation is outside the repeatable range, additional systems are used to shift the robot program enabling maintenance of a quality weld. These include. Touch Sensing: This feature is standard in Kawasaki arc welding software. A low voltage is applied to the welding or filler wire and the robot searches for the edge of a part. When the wire contacts the work, robot software automatically changes the programmed positions to correct the error. Higher detection voltages can be used where the part is not always clean or has mill scale. Through Arc Sensing (Kawasaki RTPM option): This option is used on thicker work pieces. The system monitors arc length and by weaving the weld wire from side to side in a V joint, modifies the robot programmed position to maintain the arc at the centre of the V.
Laser Tracking: This option uses a laser beam and its reflected signature to detect the arc joint. Search routines can determine the weld start and finish or detect the weld joint position whilst welding. Torch Cleaning: Gas metal arc welding deposits some spatter into the nozzle. If left unchecked the gas flow is disturbed and the weld quality decreases. On light duty Robot installations the nozzle can be cleaned manually. Most robot arc welding stations are high duty cycle and require automatic nozzle cleaning stations. MIG Welding is often referred to as the “hot glue gun” of the welding world! By definition, MIG welding is the process of using electricity to melt and join pieces of metal together. RTA can evaluate your current welding parameters and techniques and help you optimise your current MIG Welding process variables. 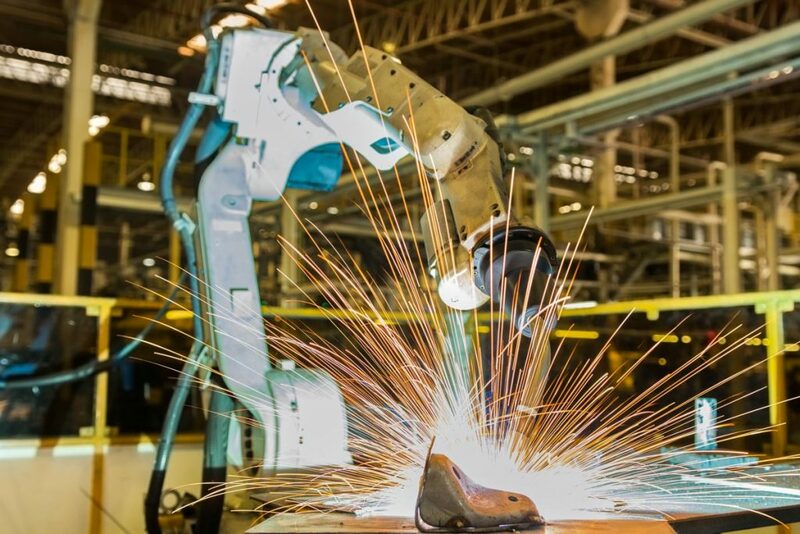 We have installed many MIG Welding robotic cells throughout the automotive manufacturing industry – including being sole supplier to Ford and Toyota Motor Company Australia. Our extensive experience and respected partnerships with welding equipment suppliers, such as BOC, ensures that RTA can develop a solution that meets and exceeds your manufacturing needs. Robotic flame brazing is used to braze pipes into tanks in place of expensive and dedicated fixed tooling. Automated Braze Wending offers precision results, hassle-free operation and a huge reduction in OH&S concerns in a busy, noisy work environment. Robotic Spot Welding is achieved by coupling a spot welding gun onto a Robot wrist. Specialised welding guns are manufactured to suit this application and these guns have varied in design over time as technology has improved. Reduced impact on welding electrodes improving electrode life. Reduction in noise from both electrode impact and pneumatic noise. Reduction in gun moving parts as software now compensates for electrode wear. Zero compensation force allowing reduced fixture complexity and strength. 3D robot-vision and sensing systems allow for the transfer of multi-dimensional feedback on targets. This input is provided in a language that is instantly recognisable by the robotics system. It is essential in allowing for the intricate visual inspections that are integral in increasing the scope of robotic welding applications, enabling robots to take complex actions based on visual interaction with the target piece. The difference between these new form of sensors and older models is that it allows the robot to analyse and interpret data from an entire image, rather than a singular point. New sensors consist of a camera that takes a photo of sections of the part. These photos are then sent to the memory where it is processed and analysed via a series of comparisons against pre-set parameters. For welding and fabrication, these parameters include aspects such as wire feed speed, weaving, travel speed and voltage. As the vision sensor tracks the part, it compares what it sees against the set parameters of these aspects, determining whether the component matches the inputs. This feedback then allows the robot to dynamically adjust the welding parameters to complete the weld. The applications of these parameters range from a focus on V-prepped joints for volumetric ‘fill,’ to more advanced adaptive welding systems which can find and track seams, find parts, coordinate motion, monitor in-process weld quality and offer adaptive process control and multi-pass welding through root pass memorisation (RPM). When a laser vision system is used in conjunction with offline programming, it makes it possible to integrate robotics into small production runs. Constant current and constant voltage control. Absolute control of the various times required by the spot weld process. Step up or linear up control of weld current to compensate for weld tip area increase. Inverter technology that reduces transformer weight, maintains welding parameters with faster accuracy. Because welding current is DC, inverter technology also removes the effects of inductance. on how robots can be integrated into your operations to benefit your business, consult the experts at RTA about your requirements.